The first letters and figures of an amateurradio-callsign is named "prefix". It shows the home country of the given radiostation. Besides the "DX Century Club" (DXCC) of the American Radio Relay League (ARRL) worldwide actual 355 DXCC-countries are valid. 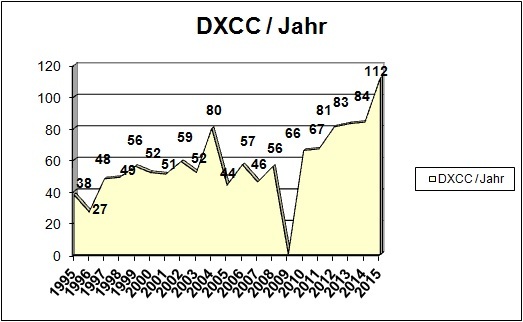 During their yearly whitsun-activities OZ1RDP made contacts to 164 DXCC-countries - partly on different amateurradio-bands. In all 618 country-contacts on different amateurradio-bands are in the log. The following tables show - devided into continents - what DXCC-countries were contacted by OZ1RDP on which amateurradio-bands. This could be 1 QSO (D2 / Angola) or 5.461 QSOs (DL / Germany) p.ex on the 40m-band.